The images of atrocity, either analog or digital, are always the trace of an encounter between the gaze of a photographer or a cameraman and a human being suffering from the painful effects of man-made violence. The archive images resulting from such an encounter raise some inevitable questions: who took them and for what purpose? Is it possible to retrace the process that led to these shots? What do they hide behind what the eye can see? 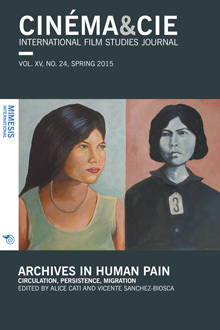 This special issue of Cinéma & Cie will not only focus on the production of such images, but also on their persistence on the synchronic level (in the media: newspapers, magazines, cinema, television, the Internet, museums…) as well as on the diachronic level (across time: mutation, re-editing, inversion…). From propaganda to counter-propaganda, from purposes of memory to artistic aims, the circulation of these images proves that repetition always implies difference.